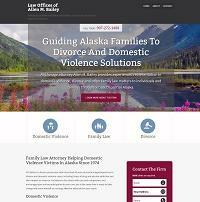 The Law Offices of Allen M. Bailey handles divorce, child custody and domestic violence cases in the Anchorage area of South Central Alaska. Allen has extensive experience in cases involving child custody, including relocation, domestic violence, addiction and mental illness. He has worked with men and women who were victims of domestic violence for more than 30 years. Allen M. Bailey, J.D., grew up in Anchorage, Alaska, and has practiced law there since 1974. He was the Anchorage Borough and then Municipal Prosecutor for over 10 years and has been a family lawyer since 1985. He has also been counsel in more than 50 appeals before the Alaska Supreme Court and Alaska Court of Appeals. As a family lawyer, Allen's practice focuses primarily on child custody matters, divorce cases and protective order cases. He has written journal articles involving child custody and family violence, and is co-author of Alaska's statute establishing a presumption against placing a child in the legal or physical custody of an abusive parent. Overseeing the firm's daily operations is office manager Lisa L. McAlees, who has worked with the firm's clients since 1987 and provides paralegal assistance and other services. To schedule a full discussion of your family law issues with an experienced attorney, contact the Law Offices of Allen M. Bailey in Anchorage for an initial consultation.